Housing units built exclusively for local residents will be opening up to tenants this fall with construction of a 138-unit residential project at 10470 East Jibboom Street nearing completion. Though the planning process has been ongoing for two years, developers finally broke ground in late 2018. “To work on a project for two years then finally see it go vertical is awesome,” said Mike Foster, a partner with Triumph Development, the company building the units. The apartment buildings will have a total of 33 studios, 54 one-bedroom units, 42 two-bedroom units, nine three-bedroom units, with barbecue and picnic areas, a bocce ball court, a volleyball court, playground and rooftop decks. 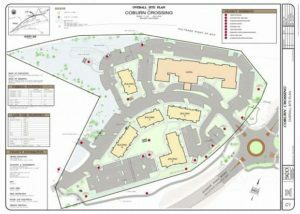 In addition to the residential units, the project will include a 114-room SpringHill Suites hotel on a 2.8 acre parcel. Triumph turned the hotel development over to Glacier House Hotels; it is expected to be done by September, according to their website. The hotel will include an exercise room, pool room, small market, prep kitchen with breakfast center and a meeting room and offices. According to a town staff report the hotel will provide 40 to 42 jobs. Of the 138 apartment units, six are proposed to be income-restricted workforce housing units for the hotel with the rest to be deed restricted to full-time residents. 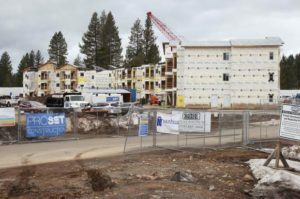 Foster said that all the tenants must be working 30 hours a week in the Tahoe Truckee Unified School District boundaries. “We were trying to figure out a way to achieve the locals housing but not have to meet that certain threshold of income,” said Foster. With new building complexes came a need for new infrastructure, Foster said, some of which the Town of Truckee took on, including the installation of a roundabout at Jibboom Street and Donner Pass Road. “We said if you do that, we’ll deed-restrict 100 percent of our units,” said Foster. Additionally the developer will be expanding Jibboom Street 600 feet to the west, creating sidewalks and extending water, gas and electricity lines. During the planning process, Foster said he had 50 meetings with residents, the chamber of commerce, the downtown business association, and other community groups to ensure that the project met the community’s needs. “We were telling them what we were doing and getting feedback so we could create the best project possible for the town of Truckee,” said Foster. Despite gaining approval from the town Foster said there were still hurdles to get over before breaking ground. “It’s a difficult place to build. Truckee and the Tahoe area have a lack of housing. Going through this process you can understand why,” he said. One challenge for developers in California are energy-efficiency regulations set forth by the state in Title 24. “I know what it’s trying to achieve but it makes it tough for a developer trying to make a project come to life, and still make the bottom dollar work,” said Foster. The development company originally planned on breaking ground during summer of 2017 and completing the project by spring of 2018. However, Foster said the funding they were relying on through the Department of Housing and Urban Development fell through. He said 13 months into the process the department did not approve financing for the project as they did not believe Truckee qualified as an area in dire need of housing. “Because we’re doing 100 percent deed restricted in a market that we know needs housing as bad as it does, we thought we had the perfect project for them,” he said, adding the need to find other routes of financing delayed construction until fall of last year. "If you want a realtor that listens to your needs, fights for you, and still cares about you 6 years after close of escrow, then Nicole is your girl! I contacted Nicole to show me a house in kings beach,... continued"